Denial — "I am NOT a wine blogger. I'm a writer! This can't be happening, not to me!" Denial is usually only a temporary defense as the individual realizes they have an irresistible urge to write a wine blog. Anger — "Why me? It's not fair! How did this happen to me? Wine blog judges are idiots!" Once in the second stage, the individual recognizes that denial cannot continue. Anger and jealousy issues arise. "My blog is just as good as Dirty Mouth Wine or Grape-a-Saurus and Sniff This! Why don't I have more readers and awards? I want an award! And why can't I have a crazy unpronounceable name like Yalder Arrow? I'm somebody toooo!" Bargaining — "I will post every day for a year if I can just get a trip to France and several cases of wine samples every month. I promise I will only blog on weekends and days that end in 'Y" and I vow to see my family more than once a week." The third stage involves the realization that you might get some free stuff because of your blog, but maintaining a wine blog is a lot of work. This stage is more difficult for bloggers who have non-blogging spouses and actual day jobs. Depression — "Hey, what's with all those other bloggers I see going on press trips? And where are my wine samples!?! How come I'm not getting all that free stuff? My blog is not the ticket to respect and credibility I once thought it would be." The sad realization you are not, and never will be, The HoseMaster of Wine sets in. Acceptance — "I am a wine blogger. I attend conferences. I have business cards. I go on press trips. I get free wine samples." Admitting that you are a wine blogger is the first step to a normal blogging life, quickly followed by complete acceptance. "I am a slave to my blog. I am so depressed." NOTE: I started my blog because I wanted to attend the 2009 Wine Bloggers Conference and the sign-up page required you submit the URL of your wine blog. So I bought a domain and started a wine blog. Just like that. I had no idea where this ruse would lead. But I must say wine blogging has been berry berry good to me. If you don't have a wine blog I urge you to start one today. You'll be amazed at how many people you'll irritate and annoy if you do. Plus, the 5th Annual Wine Bloggers Conference is in Portland, Oregon this August, and you need to have a wine blog to attend. Hope to see you there. ADDENDUM: The Portland WBC is sold out. But I hear Ron Washam is holding a poodle grooming and blogger de-programming seminar that weekend. Apply now by sending Ron a 500-word essay on why you deserve to live, along with your $1200.00 non-refundable deposit check. We dashed around Lecce in the rain stopping in a wine shop bookstore combination and in Maglio a chocolate store that was like a art gallery of confections. Books, wine and chocolate...now that's a perfect pairing for me. 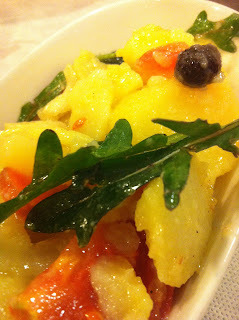 I showed some of what we ate and drank in the video on my last post, (see it again at the bottom of this post) but here are more details on the wine and food in southern Puglia with Fabio. After poking around Lecce in the rain we had a glorious meal at the now famous, but still unassuming, Le Zie Trattoria, run by the Auntie of Franics Ford Coppola. Le Zie is small, with less than ten tables, it's like you are siting in someones living room. Coppola's picture hangs on the wall along above the chair rail where locals tuck their business cards. No menu. No wine list. 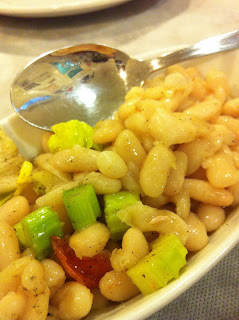 Dishes just started to appear and it was all outstanding: A plate of cannellini beans was mind-boggling in it's simplicity and flavor. 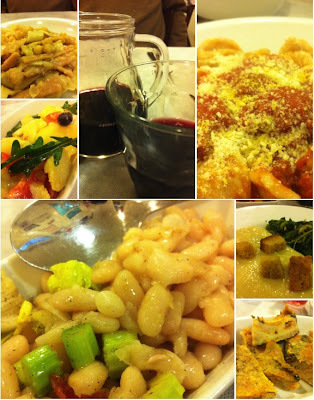 Also exceptional was the chickpea purée with chard and croutons soaked in olive oil, and the tipical Puglian orecchiette pasta with delicate pork and beef meat balls dusted with pecorino. The end-cap of the meal-- homemade cannella (cinnamon) and bay laurel liquors were a tonic for my chest congestion and better than the Medi-Nait, the Italian version of Nyquil. Puglia is one of the few regions of Italy I had not previously visited. I got a great overview on the wines of Puglia during the sponsored tasting at the IWINETC conference and was looking forward to visiting the places Fabio had selected for my wine mini-tour. A visit to Cantele is a must. There is something special going on here. Paolo Cantele and his brother are carrying forward the traditions of the family wine business and doing a tremendous job of it. I found these wines to be elegant and balanced but very unassuming. 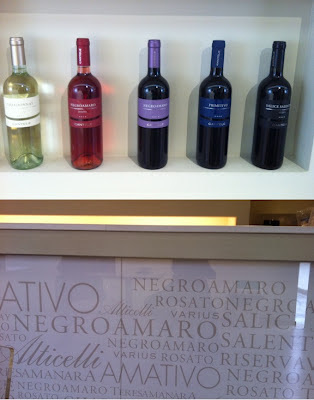 I liked everything they poured from their spicy Negromaro Rose, to the solid Salice Salentino Riserva. 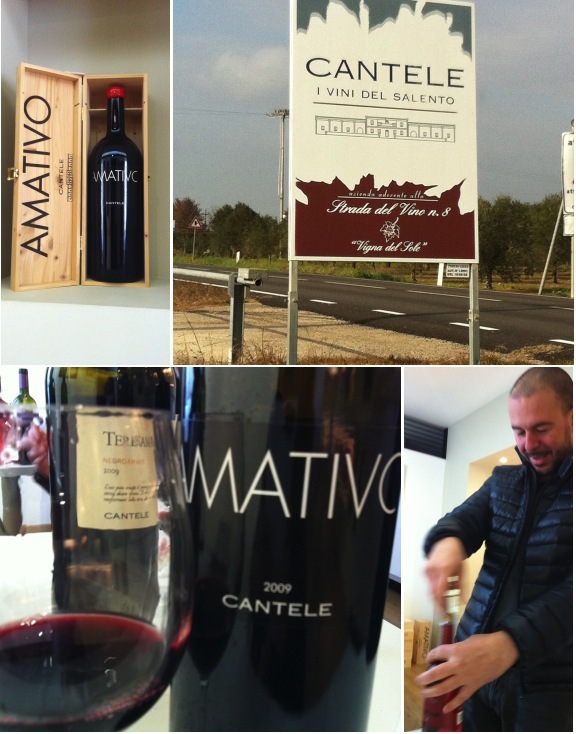 My favorite was the Amativo 60% Primitivo 40% Negroamaro-- soft and luscious with rich fruit balanced tannins. 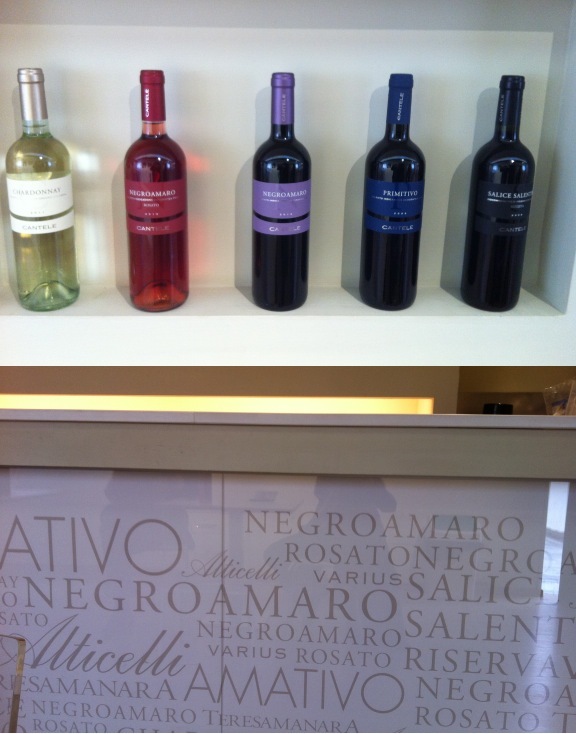 I also enjoyed the 2009 Teresamanara 100% Negroamaro a spicy and perfumed wine named after their grandmother. There is a great sense of harmony at Cantele. You can feel it in the people, the place, and especially in the wines. 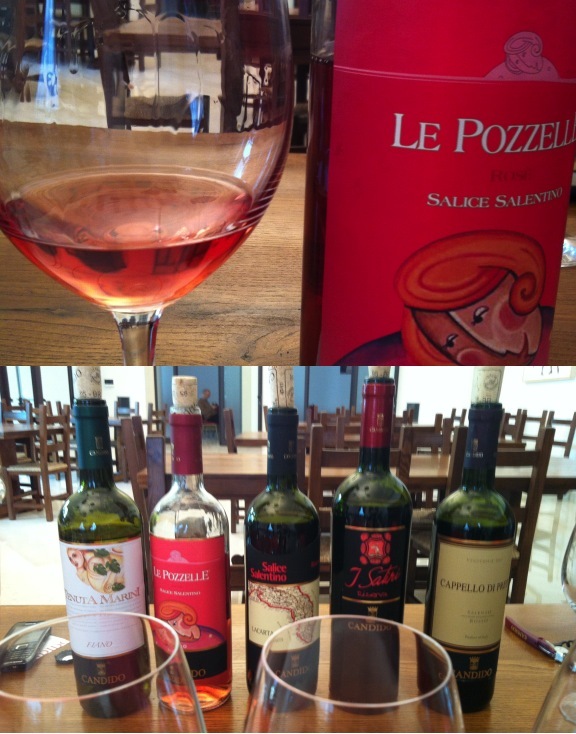 At Candido, in San Donaci, we met with Francesca Mancarella who guided me through a tasting of several of their most popular wines. The delightfully dry Le Pozzelle Salice Salentino Rose was a standout as was the La Carta Salice Salentino Riseva made of 95% Negroamaro and 5% Malvasia Nera. I also tasted the very bright Tenuta Marini Salento Fiano, that was full of fresh apple and mineral flavor. Francesca advised that the best way to experience their sweet red Aleatico was with a piece of dark chocolate and create a "Mon Cheri moment" as she called it. We took a bottle home and followed her advice and it was indeed the perfect pairing. 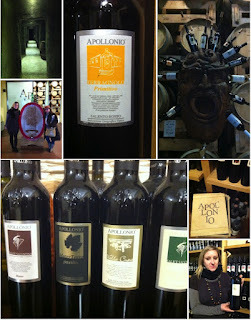 I liked the art and atmosphere at Apollonio, but I found the wines rather hit and miss. They came highly recommended, and I did try a 100% Negroamaro that I liked very much at a previous tasting, as well as the Terragnolo 100% Primitivo. But the Valle Cupa 50/50 Negroamaro-Primitivo I purchased, while velvety at first, had no underlying structure and was not pleasing to my palate. Special thanks to Fabio and his cousins for hosting me. And to Cantele, Candido and Apollonio for their hospitality.